A team of NewYork-Presbyterian experts dedicated exclusively to spine care attracts patients from around the globe. The operating room at the Daniel and Jane Och Spine Hospital looks like the set of a Hollywood movie: Cameras are set up over the operating table, surgeon-in-chief Dr. Lawrence Lenke wears a head lamp with a high-definition camera, and complicated spine surgeries are livestreamed to as many as 12 surgeons watching at a time. What’s also unique? The spectators have the option to wear 3-D glasses to get a more realistic perspective when watching Dr. K. Daniel Riew perform intricate neck surgeries while using a 3-D microscope. “The high-definition, 3-D footage gives visiting surgeons the experience of being in the operating room,” says Dr. Lenke, surgeon-in-chief of the Daniel and Jane Och Spine Hospital at NewYork-Presbyterian, considered one of the top facilities of its kind in the world, and named in recognition of a visionary $25 million gift by longtime supporters Daniel and Jane Och. Livestream broadcasts, however, are just part of the high-tech, high-touch model of providing care. The hospital also takes a unique approach to staffing: The team of surgeons, nurses, and rehabilitation and medicine specialists includes world-renowned experts in their fields who focus exclusively on spine care, which includes nonsurgical treatments as well, such as physical therapy and pain management. Unlike other facilities, where spine surgeries are performed as part of an orthopedic or neurosurgical practice, this state-of-the-art facility opened in 2015 as a hospital within a hospital — with facilities and personnel dedicated to treating back and neck problems ranging from more commonplace disk herniation and spinal stenosis to the most severe forms of crippling spinal deformities. A dedicated inpatient unit includes 15 beds, a rooftop garden, and patient navigators to help coordinate care for patients and their families. After an operation, most patients receive care in a single room until they are discharged, using a universal-care model that increases patient comfort. Like the operating rooms, these rooms are optimized to ensure patients are properly monitored by a team that is trained to specifically care for them. Dr. Lenke is more than just a surgeon here. He, along with two colleagues, Dr. Riew and Dr. Ronald Lehman Jr., helped design the hospital from scratch with a team of NewYork-Presbyterian experts. Their goal was to conceive a prototype that would set the standard for similar facilities in the future. “We wanted to design a better model of patient care,” Dr. Lenke says. That model includes access to the latest technologies, including EOS imaging. Based on Nobel Prize-winning technology, the EOS equipment scans the entire body of the patient in a standing position and not just the back. The image displays individual vertebrae position and orientation of a patient’s entire skeleton, providing physicians with a comprehensive view of any musculoskeletal deformities. It also helps them determine whether surgery is necessary and which procedure would be the most beneficial. Because an ailment such as neck pain might be the result of an issue elsewhere in the body, advanced imaging allows the physicians to better understand each patient’s individual skeletal anatomy. The EOS machine also creates 3-D images of the entire spine — a tool that used to require a radiation-intense, 2-D CT scan. The hospital is one of a handful of hospitals in the city with EOS capabilities, and the hospital’s two machines ensure greater access for patients. 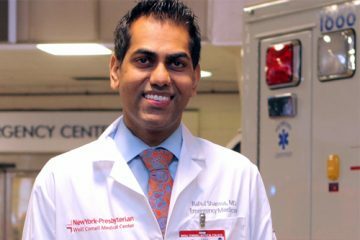 It is also a leader in robot-assisted surgeries, and was the first hospital in New York with a spinal robot that typically improves the speed, accuracy, and efficiency of spinal surgeries, and cuts down on recovery times. “We’re evolving over time in the procedures we do, [aiming] for the least amount of surgery to make it much safer with better results,” Dr. Lenke says. Patients turn to the Daniel and Jane Och Spine Hospital for its expertise in handling some of the most challenging cases. Margarida Figueiredo, a 17-year-old from Portugal, was temporarily paralyzed after surgeons at another hospital attempted to correct her scoliosis. Her doctors helped her eventually regain some neurological function, but her scoliosis grew more severe after the initial surgery and she was left in chronic pain. Another surgery would be necessary to correct the scoliosis; however, it came with a high risk of permanent paralysis. Margarida and her family soon flew to the U.S. to see him. 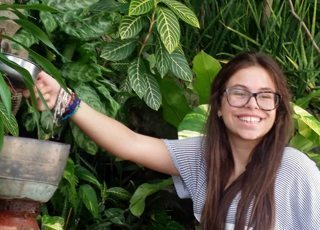 Dr. Lenke determined that Margarida needed a posterior spinal instrumentation and fusion, a procedure that is rare and, because of Margarida’s specific deformities, was high risk. For three weeks before her surgery, Margarida had her spinal column and spinal cord gradually stretched with a technique called halo traction, which stabilizes the spine to ensure a safer surgery. She also received respiratory and nutritional support, as well as physical therapy, to be as healthy as possible. When it came time for the procedure, permanent paralysis remained a significant concern. To reduce this risk, Dr. Lenke’s team worked alongside the hospital’s Spinal Cord and Nerve Root Monitoring Program’s specialized team of neurologists, anesthesiologists, and technicians, who monitor the patient’s responsiveness during surgery. After the surgery, Margarida awoke with her deformity corrected and her legs fully functioning.